You can edit and update your mailing list before you start mail merge, regardless if you set up your mailing list in an Excel spreadsheet or in your Outlook contacts. You can update your mail list before and during a mail merge. The best practice, however, would to make any updates before you begin your mail merge. Open your Excel spreadsheet or your Outlook Contacts. Make any additions, deletions, or corrections. Even if you've started a mail merge, you can still update your mailing list if you typed it in Word. Open your existing Word mail merge document if it isn’t already open. On the Mailings tab, in the Start Mail Merge group, choose Edit Recipient List. 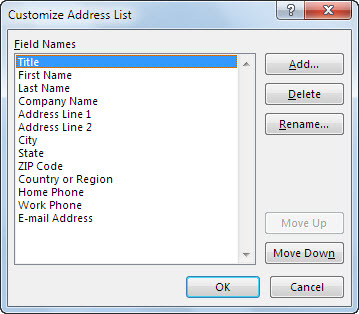 Under Data Source, choose the name of your mailing list file, and then choose Edit. Choose the information, and then change it. Choose New Entry, and then type the information in the shaded row for each column. In Word 2013 and Word 2016 you have the following option. Choose Customize Columns > Add. Then in the Add Field dialog box, type the field name, and then choose OK. Then choose OK again, choose Yes to save the changes, and OK to finish. The columns in your mailing list are the merge fields you use in your mail merge document. 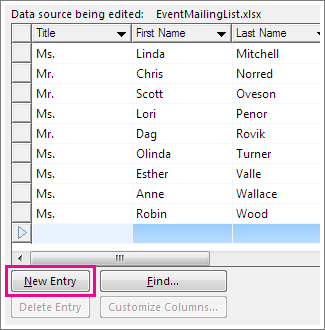 If you want to include different kinds of information, you can create new columns. 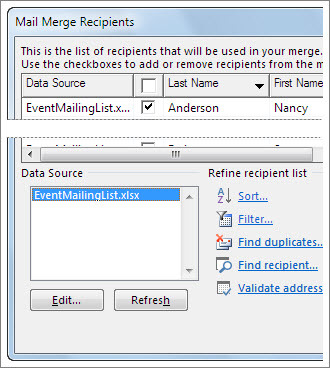 For example, in an email merge, you can add a Personal Message column to include a personal note to people you want to thank or to follow-up with. You also can choose a column and use the Move Up or Move Down buttons to change where the column is in the list. After you make the changes you want, choose OK. When prompted by Word to update your mailing list, choose Yes. Now you’re ready to insert mail merge fields in your document. For more information, see Insert mail merge fields.